14 Aug New low for the EYCI. 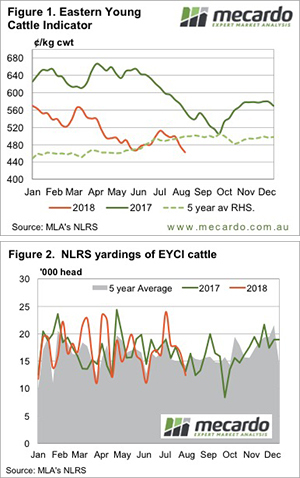 The little rally for the Eastern Young Cattle Indicator (EYCI) is well and truly over. The dry weather concerns have taken over and are seeing the downtrend resume. Interestingly, yardings were also very low, which means demand is likely the issue. After holding on at around 500¢ for most of July, August has seen the rug pulled from under the EYCI. This week there was a 15¢ decline, taking the EYCI to a new three year low of 462.5¢/kg cwt (Figure 1). Growers were already unimpressed with prices, as yardings have fallen to their lowest full week level for the year (Figure 2). It’s not unusual for cattle supply to be weak at this time of year, but demand is usually starting to ramp up. 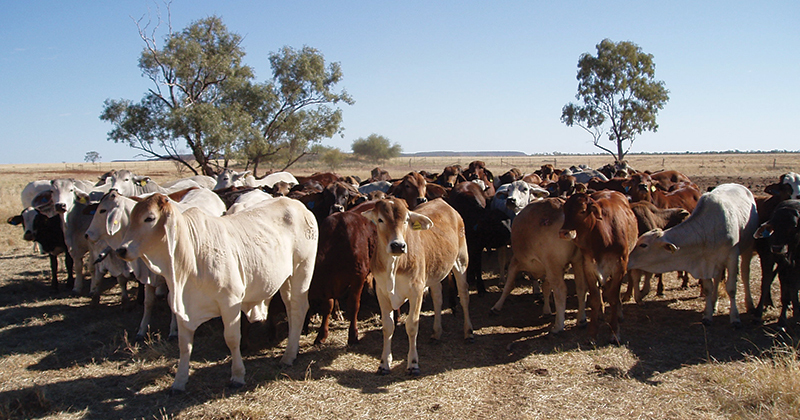 Spring growth prospects normally see strong demand for young cattle in August, but the lack of grass and expensive grain has seen that demand evaporate this year. Not all cattle prices are weak. The most expensive cattle category in saleyards thisweek was Victorian Heavy Steer, which gained 32¢ to hit 546¢/kg cwt. Obviously, demand for finished cattle in general and grass finished cattle in particular, remains very strong. Cow prices on the other hand, tanked. In Victoria the Cow indicator lost 51¢ to 351¢/kg cwt, now lagging behind NSW (359¢) and Queensland (378¢). Over the hooks values are now better than saleyards, but this might change next week. In the west things still look reasonably good. The WYCI is maintaining its strength at 534¢/kg cwt, while Cows are at a strong premium to the east at 214¢/kg lwt. Unless you’re within 150km of Australia’s southern coast or the southern end of the Great Dividing Range, the rainfall forecast remains disappointing. The good news is some southern crops and pastures will get a boost over the coming week, so there might be some fodder about come spring and summer. The trick will be working out whether it’s better used finishing cattle or if it’s better to sell.